So 2016 starts off with Whole Food Slow Cooked by Olivia Andrews. As the title suggests, all the recipes are slow cooked in one pot. 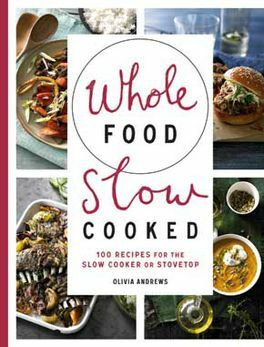 I must admit, I am not usually a fan of books that carry recipes from different nations, but Olivia has kept it all very simple and tasty, so I might be converted! I can really relate to her book because all my Mamma cooked when I was a child was one pot dishes – from open fires to pot and oven roasts. If you’re a busy parent, or you just like food cooked with minimum fuss, I think you will really enjoy these dishes, so why not give them a try? Heat 1 tbsp of the oil in a frying pan over a medium heat. Cook the shallots and mustard seeds for 3-5 minutes until the shallots have softened and are lightly golden. Set aside to cool. Combine the butter and tarragon in a bowl. Add the shallot mixture, season, and mix well. Slide your fingers between the skin and breasts of the chicken to gently loosen and create two pockets. Spread the tarragon butter evenly under the skin. Heat the remaining oil in a large frying pan on a medium-high heat. Cook the chicken, turning, for 5 minutes until browned. Layer the onion, carrot and potatoes in the slow cooker. Put 8 garlic cloves in the cavity of the chicken, then place it in the slow cooker with the remaining garlic and stock. Season. Cook on high for 3 hours. Serve with crusty bread and green salad. Slide your fingers between the skin and breasts of the chicken to gently loosen and create two pockets. Spread the tarragon butter evenly under the skin. Heat the remaining oil in a large frying pan on a medium-high heat. Cook the chicken, turning, for 5 minutes until browned. Layer the onion, carrot and potatoes in the casserole dish of the slow cooker. Add 8 garlic cloves to the cavity of the chicken, then place it in the dish with the remaining garlic and stock. Season. Cook in the oven for 15 minutes, reduce the temperature to 150°C/300°F/Gas Mark 2 and roast for a further 2 hours. Serve with crusty bread and salad.